Un-Canny: What’s the “Instead of” for BPA? | Laura's "Rules"
Un-Canny: What’s the “Instead of” for BPA? Looks like I’m not the only one wondering exactly what food packaging suppliers are using in cans and bottle lids if they are NOT using BPA. The good people over at Healthy Child, Healthy World are also all over the issue, running a great social media campaign focusing on the iconic Campbell’s company. 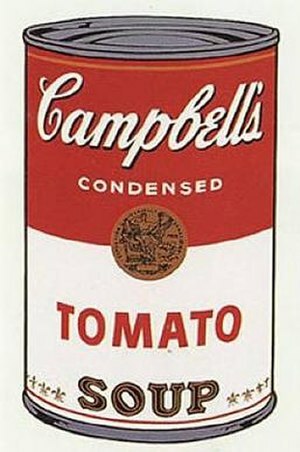 Andy Warhol would be most proud. Or not. He could be a little catty, so I suppose it’s hard to say. There’s that vinyl again. As I noted in my recipe for coconut couscous, I remain concerned that Native Forestbrand has not responded to my emails asking them what is the BPA substitute they are using for can linings. If it’s vinyl, it could be worse than BPA. I’ll be very keen to get their response, as we like cooking with coconut milk. And here’s a link to Campbell’s Facebook page, which would be a great place to post similar messages! This entry was posted in Environmental Health & Safety and tagged baby, Bisphenol-A, BPA, Campbell Soup Company, chemicals, dinner, environmental health, Facebook, food, Food & Drug Administration, Food packaging, green, health, healthy, mommy blog, organic, Polyvinyl chloride, RT!, Toxic, toxic chemicals, toxics, Twitter by Laura MacCleery. Bookmark the permalink. for months i would buy around five boxes of Lakewood organic juice only to become suspicious of their food liner. they claim it is bpa free on their website, but when i emailed and asked them if it contained PVC they flat out ignored me and gave me an automated ‘bpa free’ reply. same thing happened when i emailed YS organics about their honey in the glass jar with a metal lid (the honey isn’t great, anyway.) now i’m freaking out about how much of that juice i consumed, and i still have two boxes left that i don’t know what to do with. by the way, you can make your own coconut milk by buying shredded coconut. it’s pretty simple. you just need a blender, mesh strainer or cheesecloth and water. http://www.freecoconutrecipes.com/index.cfm/2009/12/11/homemade-coconut-milk shows one way. it’s the same for making soy milk, or any milk. you can do it with nuts like almonds, too. i’m so bummed about lakewood, though. i’ll have to start buying from fruitshare for organic fruit and make my own juice. by the way, i found your blog when i got curious and looked up ‘plastisol’ when a company told me their liners are made of ‘plastisol.’ there’s very little information out there about plastisol, so i’m glad someone is making my research easier to do! Laura, thanks for the great information. Have you done any columns on baby bottles? I’m concerned because we will have a new baby in the family come September. Thank you for all your hard work. HI Laura–Are tetra-pak boxes any better than cans? I have no idea. If they are, you can get coconut milk in boxes. I found some at Trader Joe’s with the other boxes of non-dairy milks. Hi Laura–I don’t know if tetra-pak boxes are any better than cans, but if they are, you can get coconut milk in them. I recently found coconut milk with the other boxes of non-dairy milks at Trader Joe’s.